The higher the concentration, the higher the rate of reaction. The higher the temperature, the higher the rate of reaction. Positive catalyst – Increase the rate of reaction. Negative catalyst – Reduce the rate of reaction. Only affect the reaction involve gas as reactant. For reaction involves solid reactant, when the solid reactants is broken up into smaller pieces, the total surface area of the reactant become bigger. The bigger the total surface area of the reactant, the higher the rate of reaction. The smaller the size of the particle, the bigger the total surface area. The bigger the total surface area, the higher the rate of reaction. 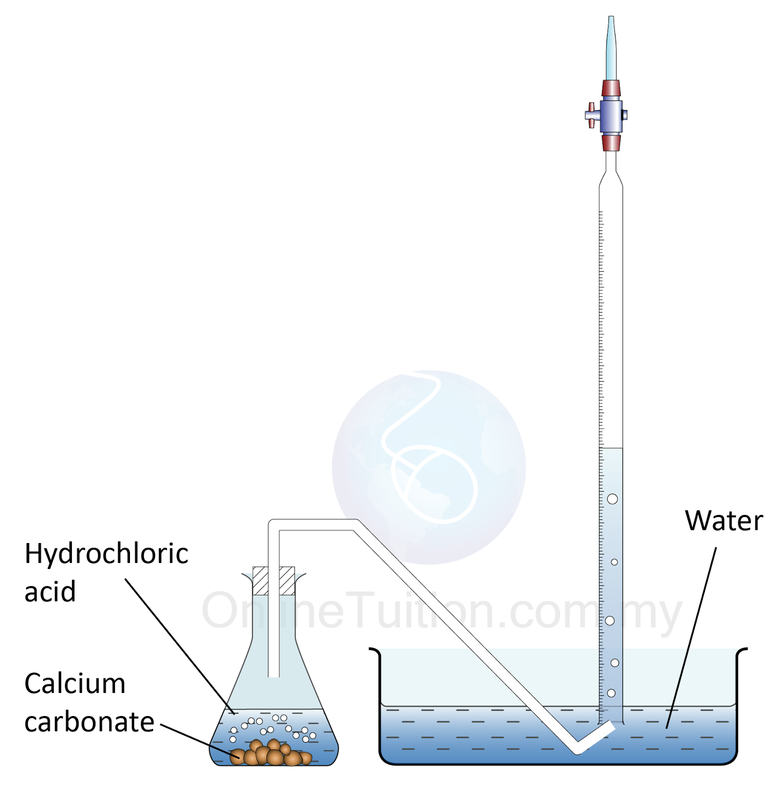 The reaction between Hydrochloric acid, HCl and calcium carbonate, CaCO3. 25 cm3 of 0.5 mol dm–3 hydrochloric acid + calcium carbonate chips. The carbon dioxide gas released is collected in a burrete. The volume of the gas released is recorded in every 30s. The result is plotted in a graph. 25 cm3 of 0.5 mol dm–3 hydrochloric acid + calcium carbonate powder. 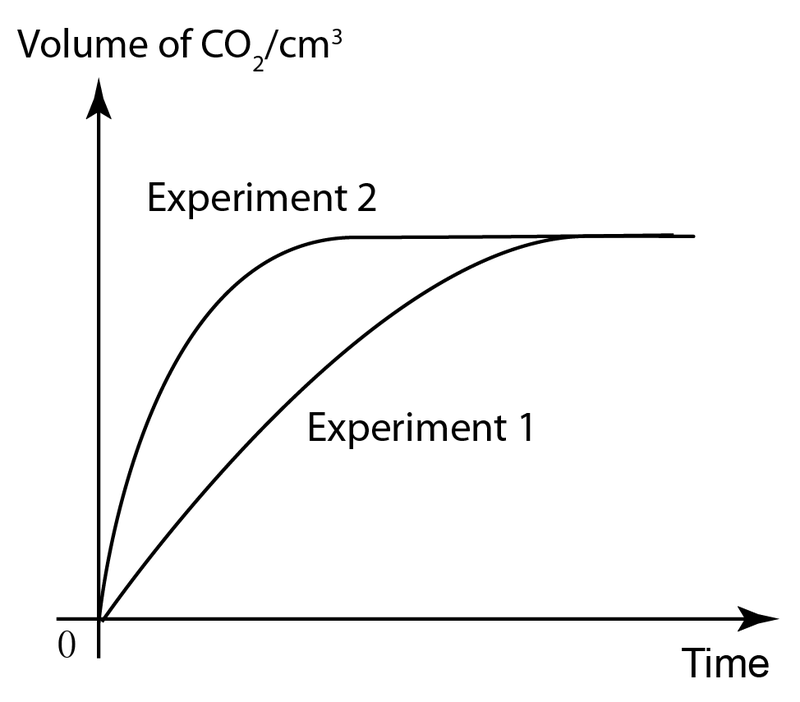 As in experiment 1, the carbon dioxide gas released is collected in a burrete and the volume of the gas released is recorded in every 30s. The result is plotted in the same graph in experiment 1. The gradient of the curve for experiment 2 is greater than the curve for experiment 1. This indicate that the rate of reaction in experiment 2 is higher than experiment 1. We can conclude that, the smaller the particle size of the reactant, the bigger the total surface area, and the bigger the total surface area, the higher the rate of the reaction will be. The higher the concentration of the solution, the higher the rate of reaction. By measuring the time taken for the formation of sulphur precipitate (yellow solid) when sulphuric acid, H2SO4 reacts with sodium thiosulphate(VI), Na2S2O3 of different concentration , we can investigate the effect of concentration of the reactant on the rate of reaction. 50 cm3 of 0.2 mol dm-3 sodium thiosulphate solution + 10 cm3 of 0.5 mol dm-3 sulphuric acid. Time taken for the ̔X’ sign placed under the conical flask to disappear from view is recorded. The experiment is repeated by using sodium thiosulphate solution with concentration 0.4 mol dm-3, 0.6 mol dm-3, 0.8 mol dm-3 and 1.0 mol dm-3. The graph for concentration of sodium thiosulphate (VI), Na2S2O3 against time taken for the sulphur precipitate to formed is plotted. 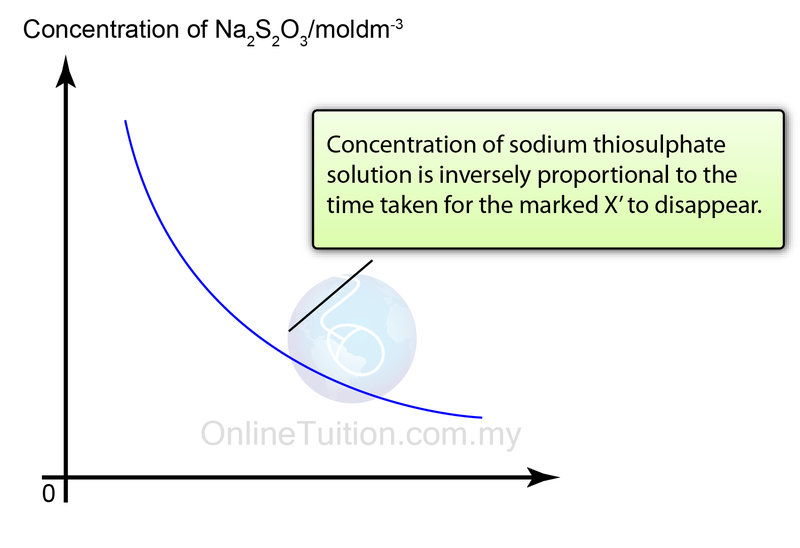 As the concentration of sodium thiosulphate solution decreases, the longer the time is needed for the marked ̔X’ to disappear. The graph for concentration of sodium thiosulphate (VI), Na2S203 against 1/time taken is plotted. As the concentration of sodium thiosulphate increases, the value of 1/time increases. We should note that 1/time = rate of reaction. 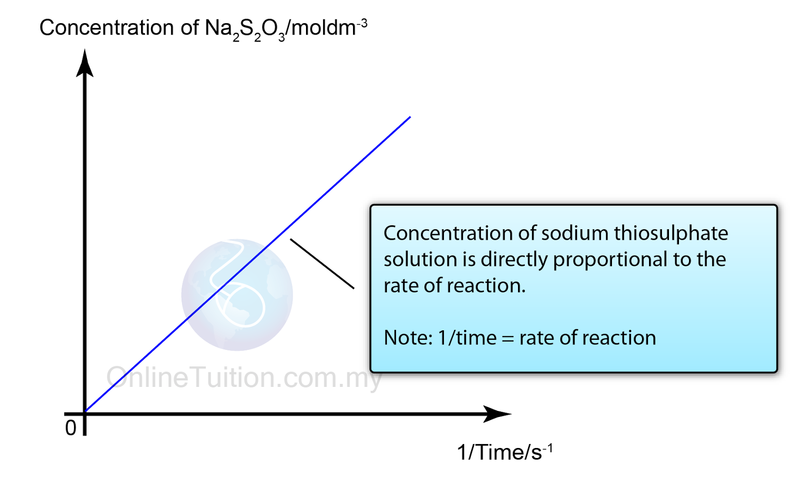 The higher the concentration of sodium thiosulphate solution, the higher the rate of reaction . The higher the temperature of the solution, the higher the rate of reaction. By measuring the time taken for the formation of sulphur precipitate (yellow solid) when sulphuric acid, H2SO4 reacts with sodium thiosulphate(VI), Na2S2O3 of different temperature, we can investigate the effect of temperature of the reactant on the rate of reaction. 50 cm3 of 0.2 mol dm-3 sodium thiosulphate solution at 30ºC + 10 cm3 of 0.5 mol dm-3 sulphuric acid. The experiment is repeated by using sodium thiosulphate solution with temperature 35ºC, 40ºC, 45ºC and 50ºC. 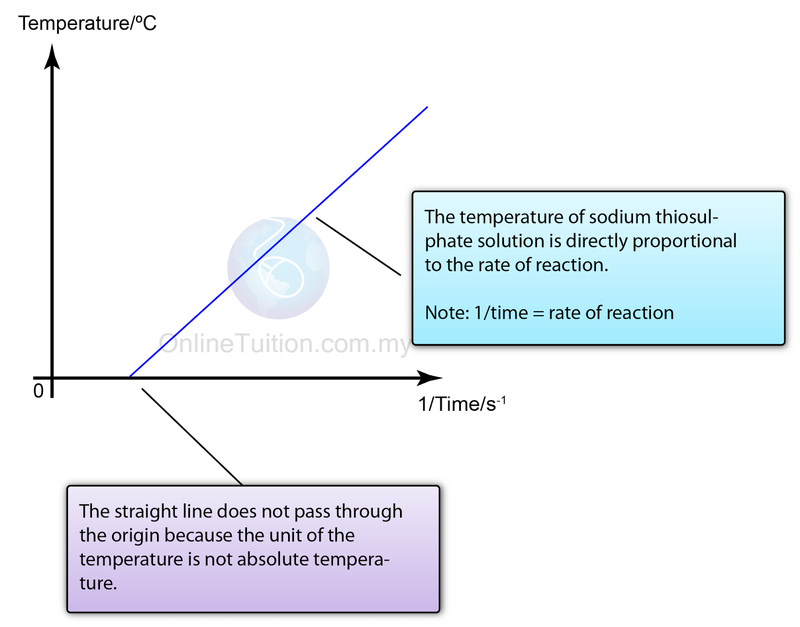 The graph for temperature of sodium thiosulphate (VI), Na2S2O3 against time taken for the sulphur precipitate to formed is plotted. As the temperature of sodium thiosulphate solution decreases, the longer the time is needed for the marked ̔X’ to disappear. The graph for temperature of sodium thiosulphate (VI), Na2S203 against 1/time taken is plotted. As the temperature of sodium thiosulphate increases, the value of 1/time increases. We should note that 1/time = rate of reaction. The higher the temperature of sodium thiosulphate solution, the higher the rate of reaction . A catalyst is a substance which can change the rate of reaction. 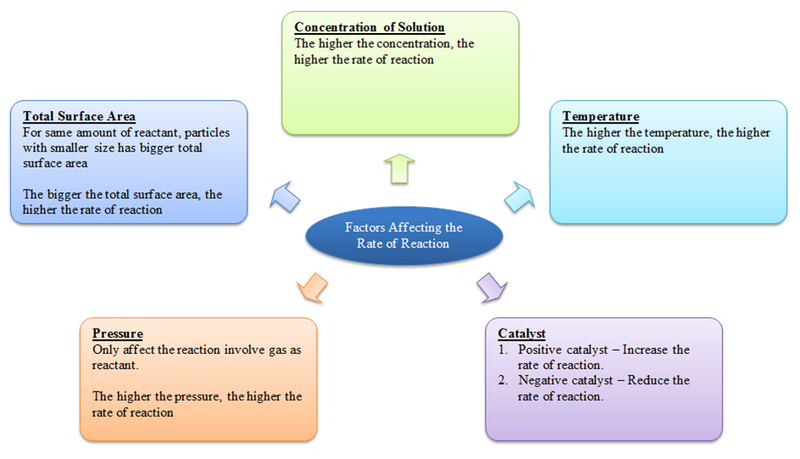 Conclusion The presence of catalyst increases the rate of reaction. Note: In SPM, you need to remember the catalyst used in both the chemical reaction above. Chemically, the catalyst remain unchanged during a reaction. Just a small amount needed to achieve big increase in rate of reaction. Catalyst in powder form can further increase the rate of reaction. Catalyst may undergo physical change in a reaction. For reactions involve gas, the rate of reaction is affected by the pressure of the gas. Pressure DOES NOT affect the rate of reaction where the reactants are in the form of solids or liquids.